Purchase this product now and earn 7,495 Reward Points! 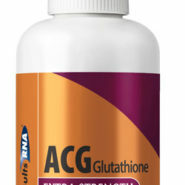 Neutralizing free radicals and reactive oxygen compounds, increased glutathione enhances every system of the body, including the immune system and metabolism; optimizing health and athletic performance. N-Acetyl L-Cysteine (NAC), Acetyl L-Carnitine, L-Glutamine, L-Glutathione Tripeptides (Reduced), Lipoic Acid (R-Fraction), Ascorbic Acid and Natural Trace Minerals.